A terrific closing episode that is actually not the bloated, special effects dominated epic I was half expecting it to be. It's rather a very intimate story about Merlin and his long lost father and the emotional impact of their separation is the core of the narrative here. 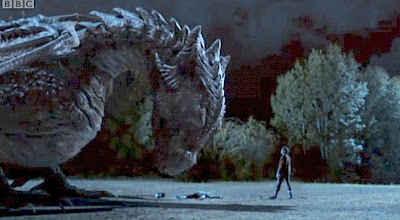 The episode is significant for not only revealing who Merlin's father is but also features the departure of the Great Dragon, which alongside the disappearance of Morgana, makes some significant changes to the format of the series. We're thrown straight into the desperate situation in Camelot as the dragon, now free, attacks the castle on a nightly basis, threatening to reduce everyone to toast. Even old Uther is seen cowering in his tower. 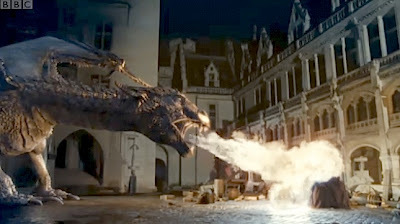 Merlin, naturally, attempts to use his powers on the beast but isn't strong enough. That's when Gaius pipes up that they'll need the service of a dragonlord to rid themselves of the creature. But Uther has wiped out all of them, hasn't he? 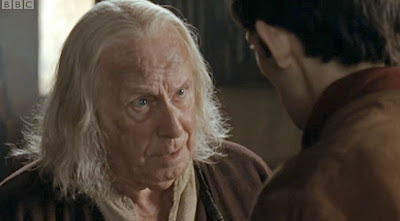 Not so, Gaius helped one man escape and in a tense scene, he reveals that the man he helped to freedom was actually Merlin's father, Balinor. It's a beautifully played moment in the episode and Richard Wilson and Colin Morgan as ever demonstrate their on screen rapport. This knowledge weighs heavy on Merlin and the following scenes where he joins Arthur on a quest to find Balinor tease the audience something rotten, making us think that at any moment Merlin will confide in Arthur. The enduring sub-plot about their deepening friendship and trust really develops in this episode and works well at keeping several revelations secret from Arthur - the identity of Merlin's father and Merlin's own growing power. The story explores their growing trust of each other but still dangles these two plot points enticingly. However, the writers do seem to be in no rush to resolve those ideas just yet. I do wonder how long they'll keep this up as we're now two years into the series and Arthur still hasn't twigged Merlin's true nature yet. Even at the end of this story, he's not aware just how important Balinor actually is to Merlin. Meanwhile, the dragon spectacularly belches fire over the knights of Camelot and continues to attack the castle. Brilliant effects from The Mill once again, particularly the close ups of the dragon in flight. 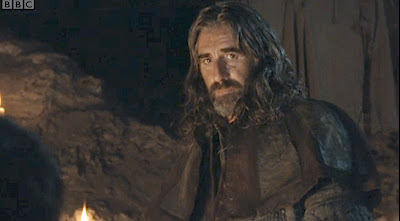 Following a lead from a tavern owner, Merlin and a wounded Arthur stumble across Balinor in a remote cave. Balinor's played by John Lynch who truly brings a sense of ancient wisdom and power to the role. He and Morgan are excellent and the initial scenes between them where they are both figuring out each other, as Arthur lies in a coma and Merlin is in a state of nervous expectation at meeting his father, are well done. And there's no fooling Balinor who knows immediately that Merlin's master is Arthur Pendragon, the son of the man who attempted to destroy all the dragonlords. We also find out that the dragon has a name, Kilgharrah, and that it was Balinor who brought the dragon to Camelot, believing that Uther wanted to make peace with it. Balinor obviously doesn't have much time for Uther or his kin so Merlin's job to persuade him to rescue Camelot is going to be difficult. It's obvious that he's going to have to confess to Balinor that he's his son. Again, Lynch and Morgan slowly tease out the scene, putting in subtly powerful performances, slowly building up to the moment when Merlin admits he is his son. It's a central scene that's the entire backbone of the episode and it's just two men sitting and having a conversation in a cave. That's confident scripting, directing and performing. Meanwhile, there's also that nice little scene on the castle ramparts between Gwen and Gaius. Gaius is very savvy and knows about the growing feelings between her and Arthur and, despite her claiming that their relationship can never be, he offers hope in that the power of love should never be underestimated. Ahhh. However, the episode has a tragic note in that Balinor is taken away from Merlin just as he agrees to journey to Camelot to help with the dragon problem. In enemy territory they're attacked and Balinor is fatally wounded. I know I'm sounding like a record stuck in a groove here but once again there's a beautiful scene between Morgan and Lynch where, as Balinor is dying, he bequeaths his power to his son. 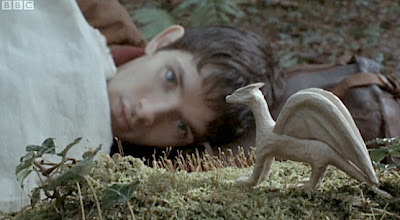 It dovetails beautifully with that rather gorgeous visual interpretation of the same when Merlin wakes up to see the carved dragon that Balinor was working on in an earlier scene. As this is happening, Merlin has to hide his tears and grief from an unsuspecting Arthur and it's very sad that he can't confide in his master as a true friend would. And in its own way, the episode is a rites of passage for Merlin as he moves from being Arthur's servant boy to become a man and a dragonlord like his father. When Arthur calls upon the knights to volunteer for the task of slaying the dragon there is that lovely echo of the knights of the round table coming together in the way director Jeremy Webb shoots that scene. There is also the great interplay between Arthur and Merlin where there is a sense of a more mature Merlin advising Arthur and both submitting to their fates as true comrades. The fight with the dragon is like something from a great Ray Harryhausen film and is superbly done, offering a sense of scale and power to the creature. After Arthur bravely attacks the creature and his knocked out momentarily (of course they've got to keep this sub-plot going! ), Merlin tames the dragon, with a Ben Kenobi type voice over from Balinor to guide him, and spares its life and banishes it from the kingdom. Epic stuff that Merlin as a series is so very good at doing. And Arthur has to take the credit, naturally. The swine. A great finale to a batch of 13 episodes that has been a vast improvement on Series One. And so, roll on Series Three. I'll be back with reviews next year. Hope you've enjoyed this year's coverage.